As National Guard members deployed to Boston last week to help clear away the snow, another band of soldiers rolled into town with a different mission: to provide relief from the weather in the form of music. The Six String Soldiers, a merry, four-member offshoot of the U.S. Army Field Band, didn’t let the blizzards interrupt their recent 10-day stop in Massachusetts. Instead, they played their six-string instruments outside, and documented the experience in a series of online videos. In their most popular video, the band played and recorded a version of The Beatles’ “Here Comes the Sun” while standing atop a snowbank. By Monday, the recording had been viewed more than 7 million times on the band’s Facebook page. The Beatles song, a much-needed reminder to Massachusetts residents that spring is just weeks away, encouraged the soldiers to post freqeuent follow-up videos, including renditions of Steve Goodman’s “City of New Orleans” and Frank Sinatra’s version of “I Love You Baby.” In those clips, they performed in front of a cow in a barn, inside Faneuil Hall, and by a fireplace. Rev. James Martin, S.J., from New York said his prayer, while done slightly in jest, was meant to cheer up residents. “You know, pretty much every place that we played, people were happy,” Lamirande said. Because of the viral video, the band got invited to a bluegrass festival in Framingham during their visit. Besides Lamirande, the group includes Seargant First Class Tom Lindsey, Staff Sergeant Glenn Robertson, and Staff Sergeant John Brandon Boron. During their pre-planned tour, the band made stops at Sullivan Middle School in Worcester, the Hibernian Cultural Center, Faneuil Hall, Gunstock Mountain Resort, Wachusett Mountain Ski Area, UMass Amherst, and UMass Lowell. 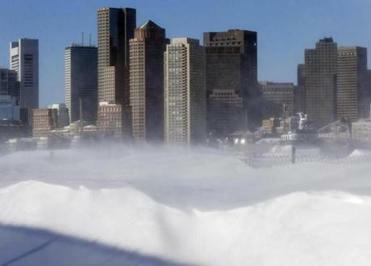 “If you’re coming to New England in February, you know what to expect, but because Boston got so much snow, it was fortuitous for us to be here at this time,” Lamirande added.